Energy management solutions for Raleigh, Durham, and Chapel Hill, NC. Energy management is simply taking control of the amount of energy used; turning lights off for spaces not in use is a form of energy management. Management can also be accomplished with automatic systems which set load priority and maximum usage levels, typically for heating and air conditioning type loads, due to these making up the larger block of energy consumption. Today energy management is a popular topic of discussion and the technology is becoming part of all energy consuming appliances as well as the type lighting used. Until recently especially in the residential markets, implementation of adequately sized generator systems did not always occur, which created bad potential scenarios for both the generator systems as well as the loads attached to the generator systems. This created the need for a new electrical rule or standard which required load calculations for the generator systems providing electricity to structure. Due to the cost associated with the installation of the necessary larger generator systems needed to satisfy this new rule, manufacturers started utilizing energy management practices so as to minimize the generator system size and ultimately cost. By load shedding at preset load levels, lower priority loads can be disconnected keeping connected demand to levels per the installed generator system. 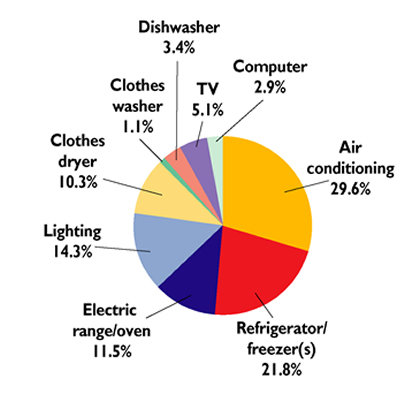 As per the diagram below, air conditioning typically is the larger percentage of consumption and is the easiest to manage. Correct management of load can provide savings without inconvenience.